In theory, the decision to outsource and therefore the need to engage a 3rd Party Logistics (3PL) Service Provider, is driven by the company’s choice to focus on core competencies, or in its quest to improve customer service levels, or as it strives to develop more efficient processes. In reality, it is mostly driven by cost, more specifically, a need to reduce the existing cost base. Regardless of the driver, managing 3rd Party Logistics (3PL) service providers can be a challenging exercise even for those who are well prepared or have had previous experience. The outsourcing life cycle has three distinct phases as represented by the diagram below. The establishment phase commences with the initial decision making process and extends through to the actual implementation and change management processes required to transition to the outsourced model. The management phase encompasses the processes required to ensure the successful operational management of the business relationship with the service provider. 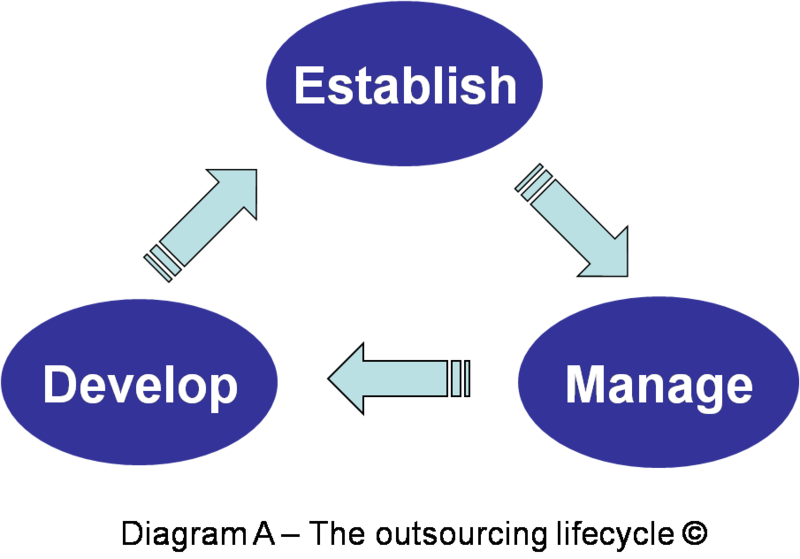 The development phase involves the transition from an operational business relationship to a more strategic and collaborative business relationship. The following posts will address each phase of the outsourcing life cycle and are intended to provide some guidance for those that have already outsourced, or are considering outsourcing, all or part of their logistics functions.